1. Pre heat the oven to 350 FH.Line and grease the cake pan . 2. Separate the egg yolks from whites . Careful , there must not be a drop of yolk in the white . Take a clean bowl , without any trace of fat or water . keep the whites there . Now beat the whites with an electric beater or mixer until stiff but not dry . keep it aside . 3. Sieve the flour , baking powder , baking soda together . Add the orange/ lemon zest in it . Add the tuttie fruttie and mix well . 4. Now in another separate bowl cream the butter, oil , sugar and cream cheese until light and fluffy . Add in the yolks , one at a time . Add the milk , add the orange juice . Mix well . Now fold in the flour in three batches . Fold in the beaten egg whites in three batches too until well incorporated . The batter may look heavy but in order to get the tuttie fruttie evenly spread out , we need heavy batter . 5. Pour in the prepared pan , tap for few times and bake immediately for 45-50 minutes or until if toothpick inserted comes out clean . Each oven acts differently , so keep an eye on the time , it may be done earlier or may take some more time . But don’t open the door of the oven too frequently not before the cake rises . This entry was posted in Glossary / Notes and tagged fruit cake, light fruit cake, tutti fruitty pound cake, tutti frutti cake, Tutti frutti fruit cake, Tutti frutti Pound Cake, Tuttie fruttie cake. Bookmark the permalink. 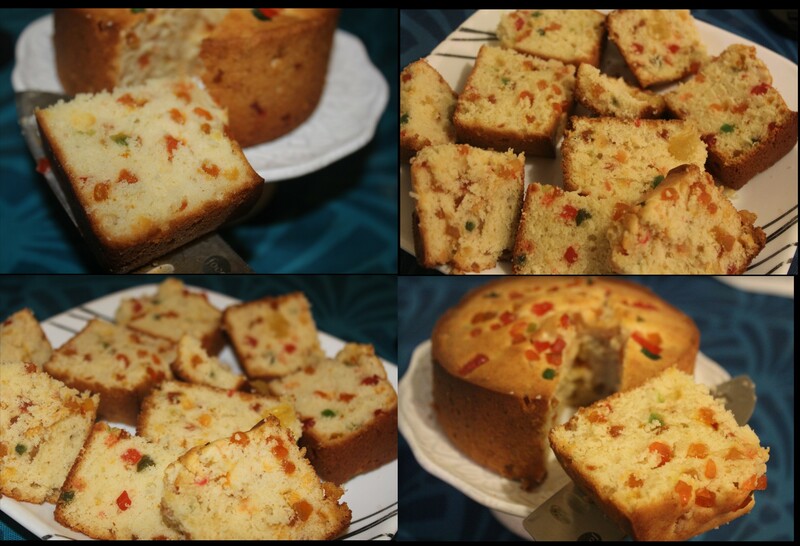 Hi, khadiza apu….thank u for this superb cake recipe !!! I have a question that, do u mean by candied fruits that are found in cans of tin, which is dipped in sugar syrup or in other preservt. solution???? Another quest is, Can I use dried fruits found in plastic packets? 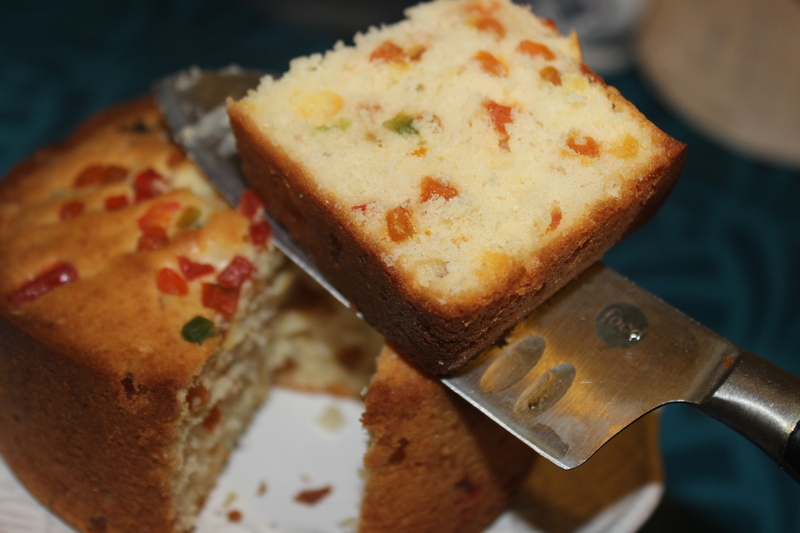 Is it good for this type of fruitty pound cake?…….pls try to reply apu…..
Apu, Thank you so much for the recipe! Definitely going to try it in the coming weekend! Achcha apu eta aar “Deshi bakery style Fruit cake” ki similar taste hobey? I want to make this one, but bashay condensed milk baki porey achey 😦 Please let me know!